James Skel­ton, has tak­en out the 2017 Aus­tralian Young Lawyer Award. Con­grat­u­la­tions to James Skel­ton who has tak­en out the 2017 Aus­tralian Young Lawyer Award. James has been engaged with NSW Young Lawyers since 2013 with involve­ment over a range of com­mit­tees. How­ev­er, his main con­tri­bu­tion has been to the Com­mu­ni­ca­tions, Enter­tain­ment and Tech­nol­o­gy Law (CET) Com­mit­tee, where he has spear­head­ed a range of ini­tia­tives and edit­ed and par­tic­i­pat­ed in sub­mis­sions on top­ics rang­ing from online copy­right infringe­ment to seri­ous inva­sions of privacy. 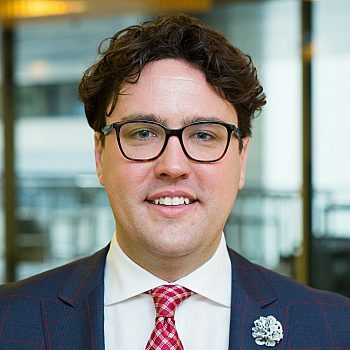 James leads the NSW Young Lawyers’ Well­be­ing and Diver­si­ty Work­ing Group, which focus­es on under­stand­ing the psy­cho­log­i­cal, phys­i­o­log­i­cal and social fac­tors affect­ing the well­be­ing of lawyers, their col­leagues, and their clients. Law Coun­cil of Aus­tralia Pres­i­dent, Fiona McLeod SC, praised Mr Skelton’s contribution. “James is an incred­i­bly dynam­ic and accom­plished young lawyer well deserv­ing of this hon­our,” Ms McLeod said. “Under­stand­ing and improv­ing the well­be­ing of lawyers is vital for a strong and healthy legal pro­fes­sion. James’ work in this area lead to last­ing ben­e­fits for lawyers and their colleagues. “This year it was a plea­sure to see James’ lead­er­ship in action as he coor­di­nat­ed the first ever float to enter the Syd­ney Gay and Les­bian Mar­di Gras parade on behalf of NSW Young Lawyers. You can read the full media release by The Law Coun­cil of Aus­tralia here.